Hanoi (VNA) – A relay will be held around Hoan Kiem Lake in Hanoi on April 9 in response to the 29th Southeast Asian Games (SEA Games 29) and the 9th Southeast Asian Games for Athletes with Physical Disabilities (Para Games 9) hosted by Malaysia later this year. 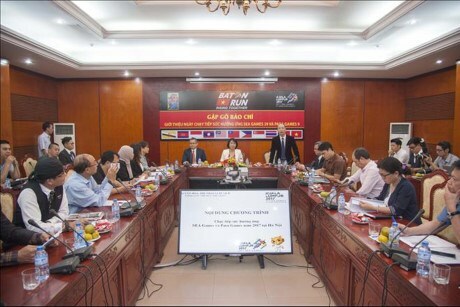 The event, which is expected to draw 2,000 participants, aims to encourage support from local people for the regional sport games while raising public awareness of the healthy lifestyle and foster solidarity between ASEAN countries, the Vietnam Sports Administration said at a press conference in Hanoi on April 4. The race will start and finish at Ly Thai To Flower Garden. It consists of three stages, passing various iconic locations in the capital city including Hanoi Opera House. It will see the participation of representatives from Vietnam’s Ministry of Culture, Sports and Tourism and ASEAN embassies in Hanoi as well as officials of the Malaysian Ministry of Youth and Sports, along with Vietnamese outstanding athletes and Hanoi residents. Hanoi is the sixth destination of the relay after Brunei, the Philippines, Laos, Myanmar and Thailand. The race will continue in Timor Leste, Cambodia, Indonesia and Singapore before transferring to the host Malaysia in May.